See screenshots attached. I have a set of presets on my Galaxy S2 tablet, say L1 through L24 or thereabouts. When I save the preset list to the H9, they all transfer except location L13, which stays blank showing the location number and big plus sign indicating the slot is empty. I have tried reflashing the H9 with the latest firmware a couple of time and sending the list again, but same results. Ideas? Thank you. Have you tried to restore factory presets and system settings? To restore factory presets and all system settings, power up while simultaneously pressing the big Knob and the Tap footswitch until [INITIALIZING] scrolls across the billboard display. CAUTION: This function will overwrite any presets that you've saved. 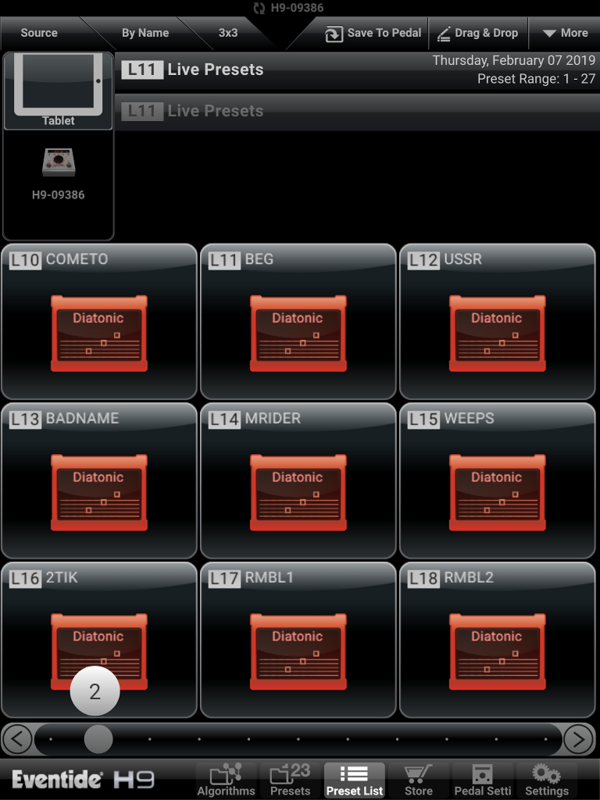 If you want to be able to restore one or more of your presets you must first save them to H9 Control. Haven't tried that yet. I have all the presets I care about stored in Control on the tablet. But, are there any other settings not stored in the preset list that I will lose when I do the reset? Yes. The system settings will be restored, so you will lose settings like your MIDI and Aux switch mappings. You did the reset and the factory presets didn't restore on your unit? Or is there no preset on the position 13? I did the reset. 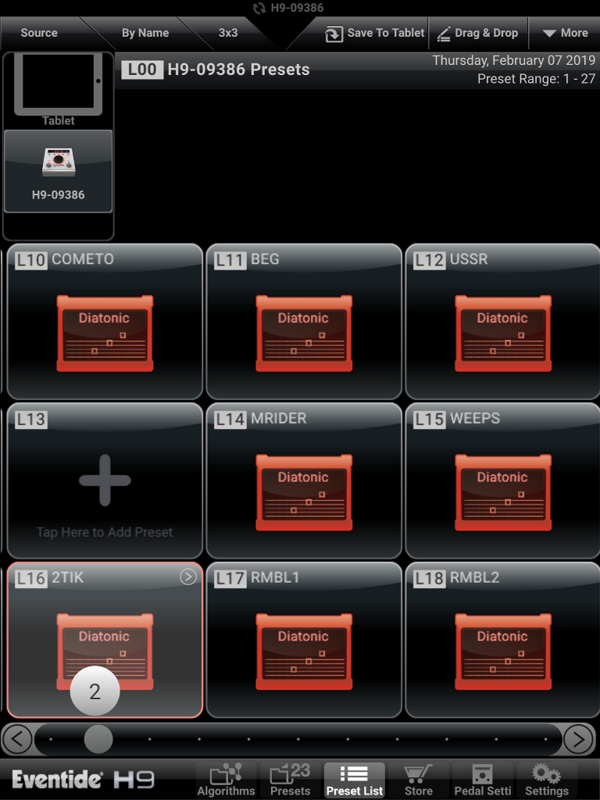 With the init presets loaded and read back to Control, position L13 shows in Control as loaded with the Ballerina preset. Then, I resent my live preset list to the pedal, and when I read the pedal back to Control, L13 was once again empty in the Control display. I went a step further and cycled through the presets from the pedal itself using the tap button. When I get to L13 on the pedal, the expected preset is there! The name is correct and the preset is what I programmed. But the L13 in Control is empty. Bizarre. Can you do me a favor to export this preset list and attach it here? You can do so by going to the Preset List screen and click "More" on the upper right corner and click "Export Preset List". I want to try importing it and see if I can reproduce your issue. Exporting the preset list opens some sort of dialog on my tablet with no choices to do anything! See attached. Ideas??? Hi, normally you should be able to choose a folder and save the list. Are you able to click the "..." on the upper right corner and choose a location like "Download" or something? Ok, a little tricky, but got it now. See attached. Thank you. Now I know what's going on. If your preset's name is "badname", it won't show up in the H9 list in H9 Control. Please rename it to something else, and then it should be working fine. Ha! That fixed it! I guess "BADNAME" must be a reserved word in the H9 programming world. Figures I would have picked a reserved word! Thanks!